Make the Kessel Run in under 12 parsecs - guaranteed! Giclee art print on canvas by artist Steve Thomas. Measures 27-inches tall x 18-inches wide! Hand-numbered limited edition of just 150 pieces! "Take Flight Aboard the Millennium Falcon! Make It There in Under 12 Parsecs - Guaranteed!" 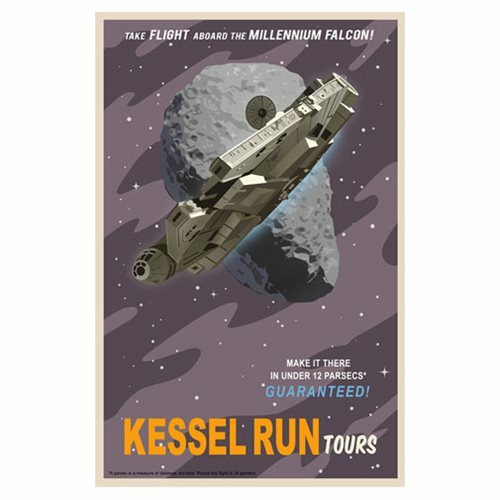 That's the claim made by Kessel Run Tours on this Star Wars Kessel Run Tours by Steve Thomas Canvas Giclee Art Print. Steve Thomas' immensely popular (and sold out) Star Wars "vintage travel poster" series is now available in a larger sized canvas edition! Measuring 27-inches tall x 18-inches wide, this unframed giclee on canvas is a hand-numbered limited edition of just 150 pieces, each of which includes the artist's authorized signature and a certificate of authenticity. Hurry and get yours! Giclee (pronounced "zhee-clay") is an invented name for the process of making fine-art prints from a digital source using ink-jet printing. The word was coined to distinguish commonly known industrial "Iris proofs" from the fine-art prints artists were producing on the same printers. The name has since come to mean any high-quality, ink-jet print, and is often used in galleries and print shops to denote such. In the past few years, the word (as a fine-art term) has come to be associated with prints using fade-resistant "archival" inks and the inkjet printers that use them. A wide variety of substrates are available, including various textures and finishes such as matte photo paper, watercolor paper, cotton canvas, or artist textured vinyl. Ages 15 and up.